WILLIAMSBURG, VA--(Marketwired - Dec 11, 2013) - The Williamsburg Warriors, a group of staff members from the Residence Inn & Spring Hill Suites by Marriott, a premier hotel near Jamestown VA, participated in the Jingle Bell Walk/Run event to benefit the Arthritis Foundation. The event, which took place on November 16th, raised money for the Arthritis Foundation, a nonprofit organization that supports the more than 100 types of arthritis and related conditions. Arthritis affects over 50 million Americans and is the leading cause of disability in the United States, yet it's often misunderstood. Many people don't realize that arthritis is not just a disease of old age. Two-thirds of people with arthritis are under the age of 65, including 300,000 children, according to the Arthritis Foundation. The Williamsburg Warriors participated in the walk to raise money and awareness for this cause. This is the second charity event the Williamsburg Warriors participated in this year. 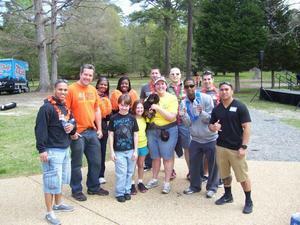 Last spring, the staff walked in the MS Walk to benefit Multiple Sclerosis. With its spacious suites, complimentary wireless Internet access, daily complimentary breakfast, and fitness center, the Residence Inn Williamsburg is a top hotel for extended stays in Williamsburg VA. Guests love the suites, which have full kitchens, living rooms, and separate bedrooms. The hotel near Norfolk Airport also has a BBQ and picnic area, a sundry store, and complimentary evening socials every day. Located in the heart of historic Colonial Williamsburg, this hotel is ideally situated near Williamsburg's great attractions. Guests can easily visit Busch Gardens, Water Country USA, the College of William and Mary, Merchants Square Shopping District and Williamsburg Pottery Factory. Golfers can enjoy the experience of 15 championship golf courses, such as Kingsmill Resort, Stonehouse, Royal New Kent Golf Club and Golden Horseshoe Golf Club. Located in historic Williamsburg, Virginia, the newly renovated Residence Inn Williamsburg is a comfortable and welcoming hotel that's perfect for an extended stay. The spacious guest rooms and suites offer the comfort of home with large living areas, fully-equipped kitchens, cable TVs, comfortable beds with plush mattresses and pillows, and complimentary high-speed wireless Internet access. This AAA 3-Diamond hotel offers complimentary high-speed wireless Internet access throughout the rooms and public areas, grocery shopping service, coffee service, an on-site Laundromat, a BBQ and picnic area for guest use, and complimentary parking. Wake up to a complimentary hot breakfast buffet each morning, or unwind after a long day with evening social hours, when guests can mingle and relax over complimentary food and beverages. Fitness-focused guests can take advantage of the hotel's fully-equipped gym or swim laps in the outdoor pool. Located in the heart of Colonial Williamsburg, the Residence Inn Williamsburg has a prime location near great area attractions including Busch Gardens, Water Country USA, Jamestown Settlement, the Williamsburg Winery, and Yorktown Victory Center.